The purpose of this investigation is to evaluate the “sustainability” in terms of fossil energy use between localized wastewater treatment at a sewage treatment facility and “hold and haul” trucking to the EBMUD cogeneration facility in Oakland for a new American Canyon winery. The 64 mile round trip to EBMUD from American Canyon @ 5 mpg uses 13 gallons of diesel. Divided by the 5000 gallons in the truck this yields .0026 gallons diesel/gallon wastewater delivered to EBMUD. Right away it is clear that local wastewater treatment requires nearly twenty times more diesel equivalent energy than hauling to EBMUD. The comparison is not quite fair because only about half of California electricity is produced by burning fossil fuels. The other half is more sustainable, although “unspecified” sources and the question of nuclear sustainability might make this a substantial exaggeration. In an abundance of generosity we will just say that half of California’s electricity is sustainable and divide the .05 gallon diesel to gallon wastewater at a treatment plant in half. At .025 gallons diesel per treated gallon local wastewater treatment uses only about ten times more fossil energy than hauling to EBMUD. Nothing is simple. 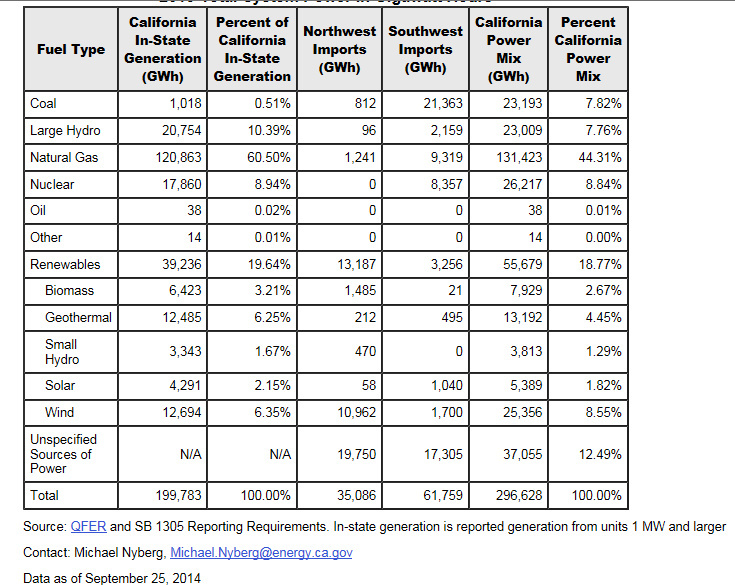 California produces most of the unsustainable half of its electricity from natural gas. To make this equivalent to the diesel burned in the truck to EBMUD this natural gas must be adjusted first by the conversion efficiency to KWh and second for the relative joule content (.67) of natural gas to diesel. We accomplish this by first dividing the .025 gallons first by the relative energy content .67 to yield .037 and this result by the conversion efficiency .32 to yield .117 diesel equivalent gallons to treat a gallon of wastewater at a typical local plant. The analysis thus far has compared local treatment with just the transportation to EBMUD as if there were no energy used to treat it at EBMUD. Surprisingly, not only is this justified, but EBMUD actually produces 20% more energy from the wastewater by cogeneration than the processing consumes. Thus we must take our .117 adjusted diesel gallons to process a gallon of wastewater at a local plant and multiply it by 1.2 to yield EBMUD equivalent gallons, yielding .14 gallons. We conclude that the .14 equivalent gallons of diesel to process wastewater locally compared to the .0026 gallons used to haul it to EBMUD reveals that local processing would require fifty times more fossil fuel that Hauling to EBMUD. We therefore further conclude that hold and haul is fifty times more sustainable in terms of fossil energy use. This entry was posted in Climate, Hold and Haul, Sustainability, Wine and tagged Hold and Haul. Bookmark the permalink.